I want to tell everyone about a book I am obsessed with- Fat Shame: Stigma and the Fat Body in American Culture by Amy Erdman Farrell. In this amazing book Farrell goes back two hundred years into the history of what she calls ‘fat denigration’. In other words, being ‘fat’ has become a way of dismissing people for a variety of reason that have nothing to do with health. Even more interesting she examines the history of the diet and anti-obesity movements to show how the have always been about profit rather than health. “Tracing the cultural denigration of fatness to the mid 19th century, Amy Farrell argues that the stigma associated with a fat body proceeded any health concerns about a large body size. Firmly in place by the time the diet industry began to flourish in the 1920s, the development of fat stigma was related not only to cultural anxieties that emerged during the modern period related to consumer excess, but, even more profoundly, to prevailing ideas about race, civilization and evolution. For 19th and early 20th century thinkers, fatness was a key marker of inferiority, of an uncivilized, barbaric, and primitive body. This idea—that fatness is a sign of a primitive person—endures today, fueling both our $60 billion “war on fat” and our cultural distress over the “obesity epidemic. There are so many examples from pop culture of fat stigma it is hard to know where to start. Everything from Chris Farley to Homer Simpson reiterate that fat=stupid, lazy and incompetent. (I love the Simpsons btw). Even a child’s film like Walle reinforces that fat people are irresponsible, lazy and idol. Even presentations that on the surface seem to encourage the right kind of weight loss, like the show ‘Biggest Loser’, subtly make the connection of weight loss and increased health. They also subliminally imply an individual who does not lose weight is a ‘loser’ in their quest for health. The most impactful part of the book for me is a study she mentions by UC Davis. Please forgive the long quote but isn’t that fascinating? I was blown away. It reminded me of why I started this whole journey. Losing weight was part of it but a small part. I wanted to have more energy, to be able to do more of the athletic activities I saw around me. I may still weigh over 250 lbs but there is no doubt I am healthier now than I was a year ago. This was such a great revelation for me because I was becoming too focused on the weight loss- seeing it as the full marker of my success. The fact I hadn’t lost the 100 lbs in one year, despite practically killing myself, made me feel frustrated and a little depressed. (I might add that these feelings were entirely self-imposed as I have received nothing but praise and encouragement from family and friends). For some reason I have always found it comforting to read about the history of philosophies and trends. Through understanding how our culture got to where it is helps me understand those around me and my own feelings at the same time. It was this sense of understanding the world that caused me to eat up philosophy and political science books in college and it is something I still love to this day. Farrell’s book helped me to understand my own feelings of inadequacy in a new way and to finally get why a nation saw me as a fat person through a particular lens. After all, they’ve had over 200 years to develop these bad habits and judgements! It also makes me want to prove the haters wrong and be a shining light to those who feel depressed over their weight. I want them to know they do have value, even if society says they are worthless. I see the worth. I know how hard it is to get healthy, but getting healthy should be the goal and if weight loss comes with, so be it! Here’s a clip of Amy Farrell on the Colbert Report talking about her book. I couldn’t embed it because of comedy central’s copyright. I know this is a long post but I really wanted to get the word out on this book. It is a bit academic (incredibly well researched) but I wish that everyone would read it. First of all, I want to apologize for my last post. I was trying to make a nuanced point about how couples can forget about their single friends. This can be very painful. No one likes to be forgotten and left behind. Unfortunately, I think the post came across differently than I hoped. Sorry about that. What good is a blog without a few controversial entries! I had a great experience yesterday. Well, it started out not so great. On Monday I was at my apartment trying to nurse away a splitting headache. I felt like my head was about to explode. Every noise, every motion felt amplified a hundred times. These headaches are a side affect to the victoza (which btw I have started taking again with, cross fingers, much better results. I’ve never had a migraine but from what I’ve heard the symptoms are similar to what I was feeling Monday. For those of you who do not know I live on the top floor of a two-story apartment building. Over the years I’ve had a number of people move in beneath me (for a long time it was an Indian couple that didn’t speak English but they had a baby which sure knew how to cry!). A few weeks ago a new woman moved in and with all the medical chaos I had not gotten around to meeting her yet. I did notice that she liked to play loud music at night (I found out later that it wasn’t music but her work out tape). Most of the time I do not care about the music but Monday it was like a sledgehammer. I decided to go down there and ask politely for her to turn the music down. I rang the doorbell and she basically said ‘what’d you want?’. I was a little flustered and asked her to turn down the music but didn’t mention my headache or anything else. She then looked very annoyed and told me that my washing machine keeps her up at night. I told her I’d stop running it late and I was sorry. Anyway, it was an awkward exchange and I felt guilty for being rude. Plus, I didn’t want her to think I was a snoopy neighbor who would whine at the slightest music. It was just this particular moment that I needed the quiet. So, after giving it some thought I decided to write her a note apologizing and explaining the situation. I also said I was sorry for the washer and to please let me know if I am inadvertently causing problems or nuisances. I left the note at her house and figured I did all I could to remedy the situation. You can only imagine how thrilled I was when later that evening the neighbor and her son appeared at my door with muffins and their own apology note. She said “I am the one who owes you an apology. Very sorry. hope you are feeling better. Let me know if you ever need anything.” This melted my heart and then we got to talk and introduce ourselves to each other. One of the hardest things in life is to take a negative situation and turn into a positive. It is hard but also so rewarding. I feel like we were able to take something awkward and contentious and turn into something happy and reaffirming. Two people were willing to let go of their pride and become stronger as a result. I’m grateful for the experience and will try to reach out and forgive more readily in the future. Happy Mother’s Day! First I want to start out by letting the mothers in my life know how much I love them. When I say mothers I mean anyone who has successfully mothered me throughout my life. I was lucky to be born to an amazing mother. 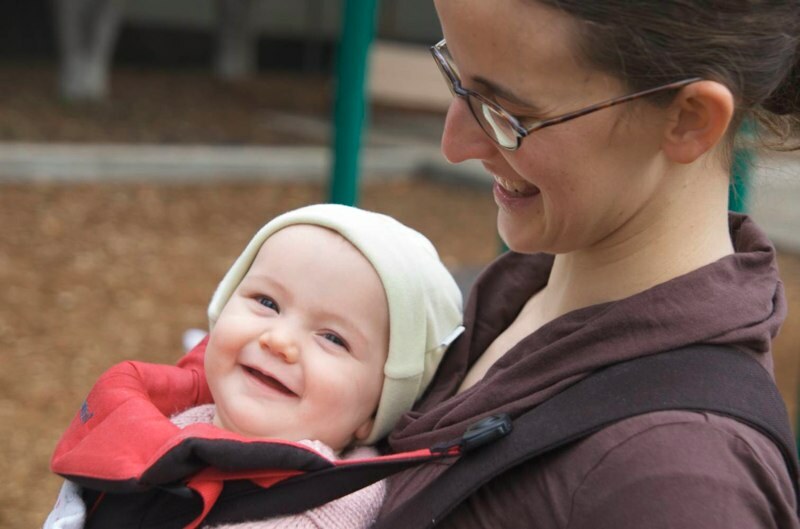 There are women who set mothering aside as a tangential part of their lives. Not my Mom. It is her whole life. She has spent over 30 years of her life mothering children. She had her first baby at 22 and now at 54 still has 2 children under 15 at home. It is a career of mothering. My mother’s greatest gift is her ability to nurture. She is the oldest daughter in a family of 8 and from an early age she nurtured her siblings on a daily basis. She taught them how to read, cook, and consoled both bruised shins and egos. My mother knows how to listen and I can’t tell you the number of times I have turned to her just to have the peace of someone who will listen. My mother is also a very interesting person. Whether it be politics, philosophy, gardening or an immensity of other topics, my mom has a love of learning and is always up-to-date on the latest study, book or publication. She certainly hasn’t let the stereotype of a housewife stop her from being a dynamic, well-read, ambitious woman. Another great mother in my life is my sister Megan. She has always been a peaceful influence in our family. There are some people who seem to be blessed by God with an ability to love unconditionally, Megan is one of those people. Despite frequent quarrels (and worse) between my brother and I, I can hardly remember a moment when the two of us (or anyone else for that matter) fought with Megan. And that’s not to says she’s a doormat because she is not. She is just a loving person that wants everyone to be happy. I think it says something that the minute she heard of my operation she volunteered to take care of me. That is so like her. She is the best! One more I can’t help but mention is my Grandma Wagner. 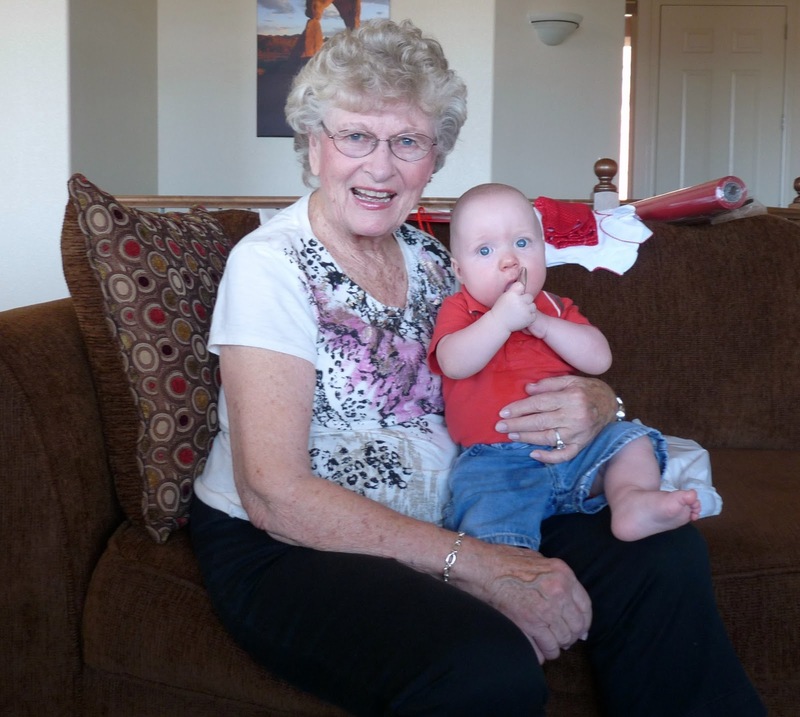 Both my grandma’s are wonderful but my Grandma Wagner has taken a special interest in my life that I appreciate. She seems to always call to ‘check up on me’ when I need it most. She is also a great listener and is honestly one of my best friends. I can’t imagine anyone not loving her. I’ve always had a great need for validation and love in my life (I suppose we all do but my needs are more pronounced than some). For some reason, I need to know that I am loved and worthy of love, and I need to hear it again and again and again. It is strange because I am also very independent and self-confident. I think everyone has a mixture of a need for both? There have been so many other women in my life, some which had no children, who have mothered me- teachers, church leaders, friends, cousins, aunts etc. The dictionary defines mothering as to “Look after kindly and protectively”. I’ve needed such kindness and sheltering in my life. I still need it and am grateful for all that have given it to me. I know I can be stubborn, independent and opinionated but thanks for loving me anyway! Today I am asking for help. This Sunday I am teaching the New Testament lesson in Gospel Doctrine (Sunday School) at church. The lesson focuses on John 9 and while it is an undeniably moving chapter, I am having a tough time putting my feelings in a coherent form. 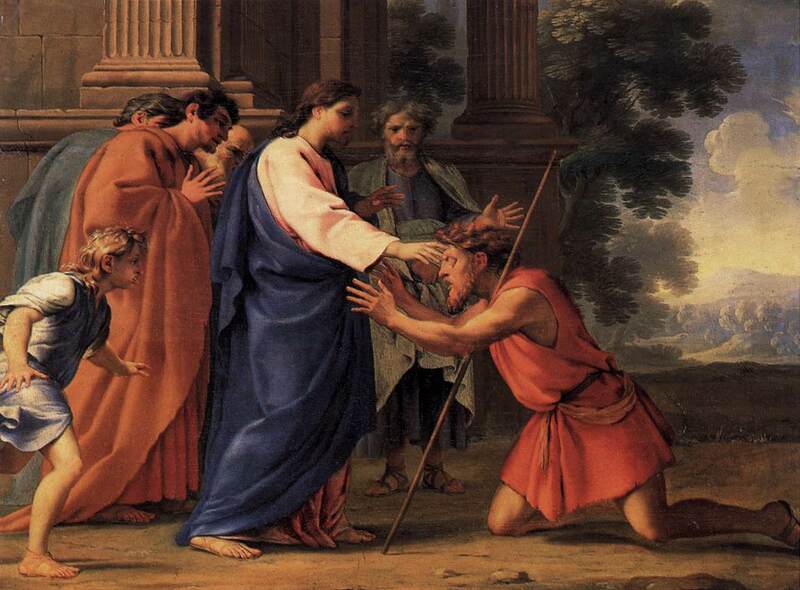 John 9 focuses on Jesus’ miraculous healing of a blind man. Jesus declares ‘I am the light of the world’ and then spits on the ground, making a clay which he applies to the blind man’s eyes. After the man washes in the pool of Siloam he rejoices saying ‘whereas I was blind, now I see!’. Such a dramatic healing is without a doubt one of the most amazing miracles in the New Testament. I suppose where I am struggling is why Jesus chose this man? There must have been thousands of blind people in Jerusalem, why heal this man? Was it just to prove a point about healing on the sabbath to the Pharisees? Was it to because Jesus knew the man would be such a diligent missionary? 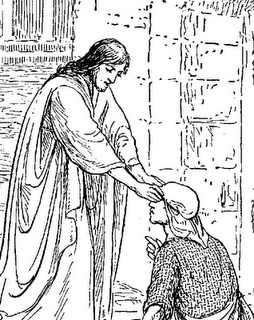 Was the man somehow more worthy or faithful than other blind people? Also, why did Jesus feel a need to go through the spitting and the clay ceremony? I can find no similar ordinance or practice in any other scripture story? Biblios says that making clay with spittle was part of many spells and incantations of the day, so it may have been Christ’s way of refuting superstitions and myths? Perhaps he was doing this just to prove that his laws and methods do not follow the worlds? I guess in going through such difficult health problems I find it tough to teach about miracles. Don’t get me wrong. I believe in them and have faith in my Heavenly Father, but I just wonder why? Why are some people seen as worthy of healing and others struggle so? Is there anything I could do to be more worthy? I know my faith can always be strengthened. It is never a finished transaction but it seems strong. I have never wavered throughout my life in my belief in Jesus Christ’s atonement or His love for me. I know He loves me and it is His love that has carried me through these hard months. Still, I don’t understand why when I am trying to do such a noble thing as get in shape I am confronted with so many obstacles? I know someday it will make sense but right now I am forced to go with faith alone. Perhaps that is what He is teaching me? It wouldn’t be the first time. There have been many times in my life when I faced unknowns and only years later did I understand why I needed that lonely experience. For example, my emotionally abusive missionary companion comes to mind. At the time I could not comprehend why the Lord had abandoned me when I was showing such faith as his obedient servant. Why when others have such positive training experiences did I get this sister? It was only later in my mission that I saw those months in a new light. It was during those lonely times that I turned to the Lord the most; thereby, making me a strong and powerful missionary. The last six months of my mission were full of converts, amazing companionships, and powerful experiences and I believe that was a direct reward from the Lord for my faith during those tough months. There are also experiences which I still don’t understand. For instance, why did I have to gain weight at 9 years old- at an age when I was practically helpless to solve the problem? Why did I have to be picked on and made fun of? Was that just to make me strong and independent? If so, why is that independence so important to my character? Couldn’t there have been another way? God and Jesus Christ know all and evidently the answer is No, but I am not going to pretend like I understand all the why’s behind that No! I guess in the end I just wish I was one of the lucky one’s. I am a little envious of the blind man and of every other healing I read about. I want that to happen to me! I believe it could happen. I have faith in miracles but I do not feel it will happen. I just know there are no easy solutions to this problem- no miracle drug, no quick fix diet, no exercise that will change everything. For some reason the Lord wants me to chisel away at this bit-by-bit. I wonder why? What is He trying to teach me? At this moment, I don’t know. I will someday. Anyway, those are some of the issues I am struggling with in crafting this lesson. If any of you have any thoughts about John 9 or healing in general I would love to hear them. Also if you have any suggestions for teaching others when you are the one with all the questions that would be great! How do you show the confidence to instruct others when you are unsure yourself? You can post thoughts as a comment or if it is too personal email/call me. Thanks in advance. 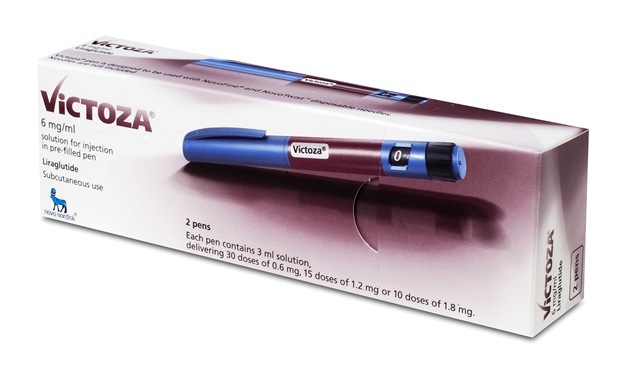 Today marks day 10 of my type 2 diabetes treatment with the injected medicine called victoza. If you can indulge me for a second I need to vent about how awful some of the side effects have been. I have been lucky so far and responded well to the other medicines I’ve taken. This was not the case with victoza. To begin with I have no appetite at all for anything. Everything looks and tastes gross. While this might seem like a good thing, it really isn’t. I also get full extremely quick- one apple will completely fill me up. I feel nauseous most of the time and nothing seems to settle my stomach. (Plus, I can’t eat any of the simple carbs that a sick stomach wants- such as saltines crackers or ginger ale). Without being too graphic I have had vomiting and other gastrointestinal problems. Not wanting to experience these side effects, I have become naturally hesitant with forcing myself to eat. The most depressing side effect of all occurred yesterday. As most of you know I love entertaining and had such a good time planning my party for the royal wedding. Unfortunately I overdid it and felt awful yesterday. I was truly miserable, in bed, all day. I couldn’t eat and then when I did I immediately began retching. All day I was either in the bathroom or my bedroom. I had a splitting head ache and my entire body hurt. Sorry for the overshare but it was a terrible day. (I still haven’t eaten today. I’m nervous to have a repeat of yesterday). Most of all it was emotionally discouraging and spiritually testing. I know God has His purpose behind these trials but I couldn’t help but ask Him some questions yesterday- When am I going to be back to myself? When am I going to be able to lead a full life? Will I ever be able to throw a party without being bedridden for 2 days? Why is my body breaking down on me? Will true health ever come? How come I seemed healthier at 313 then at 254? What’s the purpose behind all of this pain? From everything I’ve read online about 1/3rd of victoza patients suffer from nausea and vomiting for the first month of treatment and then they adjust. I don’t know if I can do this for a month. We will see. It has helped me to lose a lot of weight fast (in 10 days lost nearly 10 lbs but I don’t know if that is from not eating anything or the meds!). Surprisingly my sugars have not been noticeably lower (in the 90-110 range which is about what they were with just diet). I have an appointment with my endocrinologist the first week of June and if I am still having these side effects then I may want to stop with the victoza. Please say a prayer for me that I will begin to respond better. I want to get back to my regular life so badly. It’s beyond frustrating. Who knew the road to health was so paved with peril? Thanks to Megan for calling me yesterday- providing the one bright spot. Love you! The rest of my family has been in Europe for the last 2 weeks (I know tough life!) and I must say I’m excited for them to back. Even though they don’t live in Utah I have missed their support over the phone during these tough weeks. Poor Megan and Emily have had to absorb all of my venting! Thanks!